As part of my YSSP project for summer 2013, I developed a Web site to study consumer behaviors towards electricity market liberalization to the residential side. This liberalization means that consumers can select an energy company that has different portfolios of energy supply. It has been introduced in many countries, including the US, Austria, and Germany. The Web site, called Green Energy Consumption, is a simulated world of liberalized electricity markets—a game—that lets people make choices about their energy consumption, choosing between different providers with different mixes of energy coming from renewable and fossil fuel sources. The goal of this study is to find out how people make choices about energy, and what it takes to change people’s energy consumption behavior. A game like this could be used in countries where the policy has not been introduced to analyze whether or not a policy would work before introducing it. Now that we have developed the prototype Web site, we will analyze the simulation’s influence, using questionnaires for the simulation’s participants comparing the pre-and post-gaming experience. What you can do with this website? 1) You can simulate your energy costs and see how much CO₂ is emitted based on your decision. 2) Your decision making under a liberalized electricity market and your understanding of the consequences of your decisions with respect to costs and CO₂　emissions will be supported. 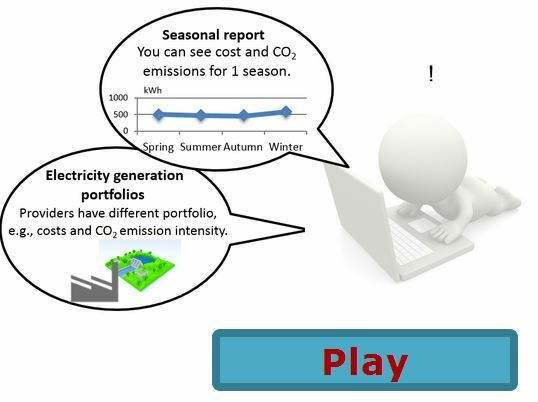 Please help me out with my research by taking a few minutes to play the Green Energy Consumption game! Kanae Matsui is a PhD student at the Graduate school of Media Design, Keio University in Japan. Her main research interest is information visualization for human behavior modification.